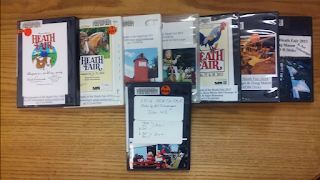 The Heath Library has eight years of Heath Fair pictures on CDs from local photographers for you to borrow and view on your computer. Art Schwenger donated three discs in 2009 and has contributed over a thousand photos each year since then. This year Art provided us with two discs containing about 1300 photos. Other photographers who have contributed over the years are Doug Mason (recent years have included aerial shots from his drone mounted camera,) Bob Viarengo, and Ron & Tiger Waterman.